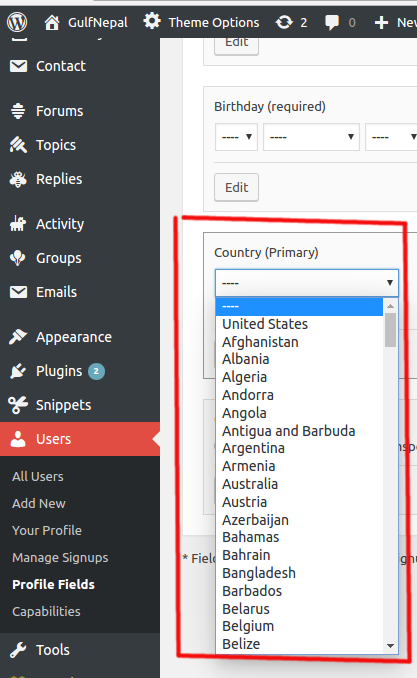 In this tutorial I will show you how you can easily add a Country list, as shown in the image above to your BuddyPress User Extended Profiles or Wordpress Registration Page using BuddyPress. 1. First head over to Github & download the following code: http://bit.ly/2f0xk7X. As you must have noticed in the comments, in the Github page of the above code; you may have to add the following line of code just before the foreach loop at line number 222; which is basically, you are initializing the value of $i to 1. Copy the above code and add it to your 'bp-custom.php' file. If this file already exists in your site then it should be located at 'wp-contents/plugins/bp-custom.php'; else you have to create it and place it at the aforementioned location. 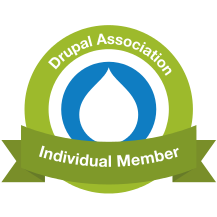 You can read more about 'bp-custom.php' file here: http://bit.ly/2y3IQak. There you will be able to understand why it's best to add the above code in your 'bp-custom.php' file and not in your theme's 'function.php' file. 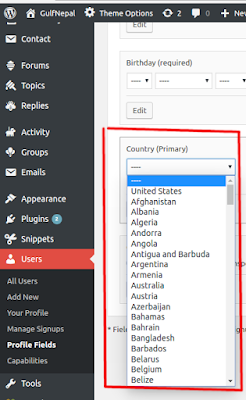 - Once you are able to view the Country List in your Profile Fields page you may remove the above code from your 'bp-custom.php' file, else your 'bp_xprofile_fields' table, which is the table that stores the above country list might go on getting unnecessarily populated with the all the above 193 country names. - Only edit your field after removing the above code from your bp-custom.php file for aforementioned reasons. 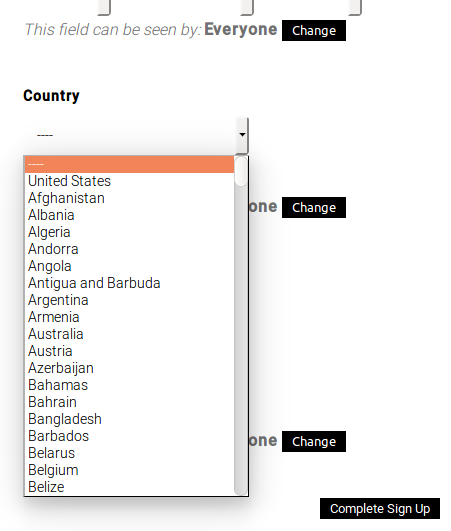 - Likewise you can also alter the value of the 'name' and 'description' fields in the code itself.